The early morning Nixle pings on our phones. Sudden banging on our doors from neighbors startling us to reality. The realization that orange and yellow hues of fire were devouring everything in site. Now our story is being told through the lens of those who suffered through the first fateful hours of the most devastating fire event in California history. 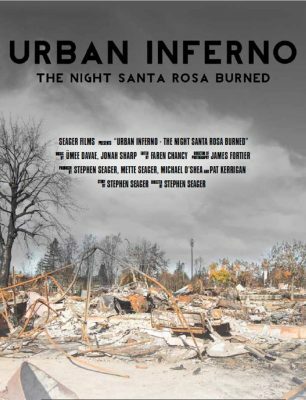 “Urban Inferno, the Night Santa Rosa Burned” is the latest documentary film from Santa Rosa’s Award Winning film-maker Dr. Stephen Seager, a local physician and psychiatrist. Dr. Seager was chased from his burning neighborhood “that terrible night”, and as he was fleeing with family and pets he declared that a documentary film MUST be made of this nightmare and it MUST be made by ”someone who lived it”.